In the late 1970s, Angelou met Oprah Winfrey when Oprah was a TV anchor in Baltimore, Maryland; Maya would later become Oprah's close friend and mentor. When Maya returned to the southern United States in 1981, she accepted the lifetime Reynolds Professorship of American Studies at Wake Forest University in Winston-Salem, North Carolina. From that point on, she considered herself "a teacher who writes"
Maya Angelou talked about her approach to teaching on Oprah Winfrey's "Oprah's Master Class." "I teach all the time, as you do and as all of you do—whether we know it or not, whether we take responsibility for it or not," she said. "I hold nothing back because I want to see that light go off. I like to see the children say, 'I never thought of that before.' And I think, 'I've got them!'" 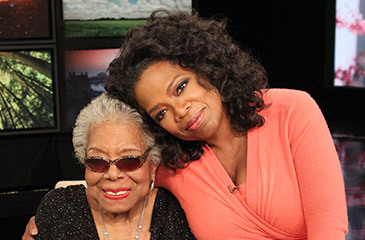 Oprah called Maya Angelou her mentor, "mother/sister" and friend. "She was there for me always, guiding me through some of the most important years of my life. The world knows her as a poet but at the heart of her, she was a teacher. 'When you learn, teach. When you get, give' is one of my best lessons from her," Winfrey said. "But what stands out to me most about Maya Angelou is not what she has done or written or spoken, it's how she lived her life. She moved through the world with unshakeable calm, confidence and a fierce grace. I loved her and I know she loved me. I will profoundly miss her. She will always be the rainbow in my clouds." Oprah..."What does Spirituality mean to you?" Maya..."Surrender. Surrender all to all."